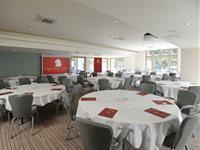 The Red Lion at Whittlesford Bridge is a modern-day coaching inn that has been renovated to the highest standards to offer professional conference and meeting facilities for up to 150 people. Our stunning business centre is an original and bespoke venue, perfect for your next meeting, away-day,canapé reception or training day. We also have a range of different-sized meeting rooms with plenty of exciting breakout areas all equipped with the latest audio-visual technology and WiFi. We are ideally located for business travellers, being one mile from Junction 10 of the M11, and offer well sourced, individual catering packages suited to your requirements. Our lovely guest larder is complimentary for delegates and boasts a cappuccino machine, soft drinks and other break-time treats. You will also have the services of our meeting co-ordinator throughout the day to ensure your event runs smoothly. We would be delighted to help plan your next event or meeting at The Red Lion at Whittlesford Bridge: please call 01223 832047 and speak to our Events Manager.